This literacy unit goes along with the book, "Chocolate Fever," by Robert Kimmel Smith. Includes reading comprehension worksheets, literature circle printables, a word search puzzle, and more. In Chapters 1 and 2 the reader is introduced to the story's main character, Henry Green. Learn about him, and then answer the questions in the accompanying activity. Choose the correct definition for each underlined vocabulary word. Words include extremely, polite, concentrate, and startling. 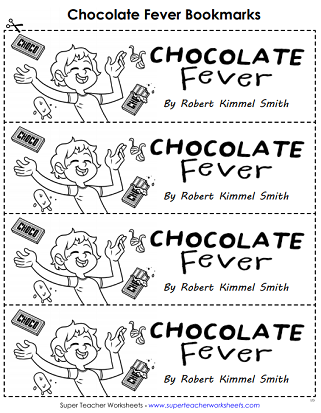 Print and cut the vocabulary cards to review the vocabulary words from chapters 1 and 2 from the book, Chocolate Fever. At school Henry begins to feel rather strange, and no one is quite sure what is happening to him. This worksheet touches on the topic of Henry's sudden condition. Match each vocabulary word from the story to the correct definition on the right. Write the letter on the line provided. Words include riot, chortled, appreciate, and peculiar. There are seven vocabulary word cards in this printable file and seven corresponding definition cards to study from. This activity has a mix of multiple choice, fill in the blank, and short answer questions based on content in chapters 5 and 6. Fill in the missing letters to create a word from the story. Write the full word on the line. Be sure each word is spelled correctly. Words include civilized, corridor, and predicament. The vocabulary words for chapters 5 and 6 include: predicament, corridor, civilized, recall, and pace. This printable file has word cards and definition cards to study from. In Chapters 7 and 8 Henry ventures out on his own and the reader is introduced to a new character. This worksheet asks questions about those topics. Read each sentence. Choose the correct definition for each underlined vocabulary word. Words include cautiously, revolting, and bluffing. The five vocabulary words for chapters 7 and 8 are: bluffing, revolting, cautiously, disposed, and ashamed. Print and cut the vocabulary cards out for your students to use. This mix of short answer and multiple choice questions asks students to recall events from the story in order to answer the questions in this activity. The picture shows a scene from Chapter 9. Write a few sentences that tell who is in the picture, where the scene takes place, and describe what's happening. Read each sentence. Look up the definition of the underlined words in the dictionary. Write each definition on the lines below. Words include aquaintance, doused, and desolate. Students can review the words: glumly, acquaintance, doused, and desolate with these printable vocabulary cards. Will Henry have Chocolate Fever forever? Or will he find a way to make his mystery illness disappear. Read the last chapters of this book, then try answering the questions on the accompanying worksheet. Match each vocabulary word from the story to the correct definition on the right. Write the letter on the line provided. Words include distributing, indeed, offend, and foil. The last two chapters of Chocolate Fever have seven words for vocabulary review, including: offend, relieved, distributing, indeed, disappearing, foil, and warehouse. Test your students knowledge with this 15 question, whole book exercise. Students must recall facts from beginning to end of the story. Find the following words in the puzzle: chocolate, cure, disease, vanilla, Dr. Fargo, Henry, hospital, Mr. Crane, moderation, Mac, spots, runaway, and schoolyard. Here are printable bookmarks you can print for your students. The illustrator draws a picture of a scene from the story. Other memebers of the group discuss the drawing. The question leader writes and discussion questions for the assigned chapters. He or she then leads the discussion group. Write a summary of the assigned chatpters. Real it to your group, then discuss. Here are more literacy unit titles. We have worksheets for many books, such as Bunnicula, Tales of a 4th Grade Nothing, Sarah Plain and Tall, Magic Tree House, Junie B. Jones, and more.